Now that the crisp autumn air has been replaced by the dreary beginnings of the Pacific Northwest’s rainy season, it’s become increasingly challenging for this island night owl to get up at the crack of dawn to hike in the cold, damp darkness. Challenging, but not impossible. I’ve just had to reset my expectations and goals: a later start means I can sleep in a tad longer, but it also means I either need to find shorter trails or ones closer to home for maximum daylight during these limited winter hours. In my childlike quest for snow today, I chose a mildly familiar trail less than an hour from our cozy house. However, I didn’t have to go very far to find winter. There was snow just outside our door! We have lived in the greater Seattle area for over six years, and this was the earliest we’ve ever had a white dusting, if any, since moving to Issaquah. My husband’s car was frosted in icy flakes, as were many a rooftop in the area. It didn’t stop me from loading up the car and traveling down Interstate 90 towards Snoqualmie Pass. The drive itself felt like I was heading into whiteout conditions. Sure enough, when I turned off the highway towards the trailhead, there were three snow plows ready for duty beneath the overpass. Seeing these trucks reassured me of two things: 1) I would actually be safer in the forest, away from poor driving conditions, and 2) I made the right decision not to drive through Snoqualmie Pass itself in search for higher elevation and more snow. Just because I have tire chains in the trunk, it doesn’t mean I’m excited to use them. As I thought would be the case, the road to the trailhead was calm and clear as the tall trees kept the elements from reaching the ground below. Just like last week, I was the only one at the trailhead parking area when I arrived onsite at 8:15am. 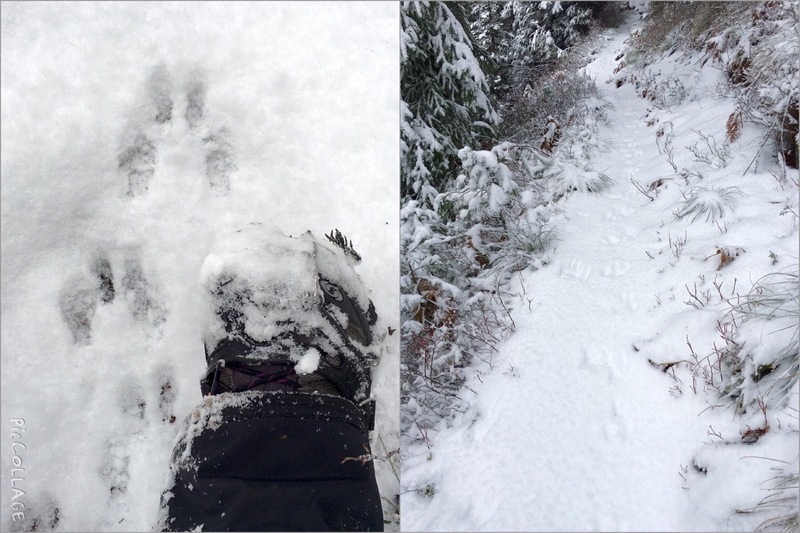 I quickly geared up, this time with my new snowshoes firmly attached to my pack, and headed for the trail. I couldn’t wait for the chance to try my new MSR Lightning Ascent snowshoes! Talapus Lake Trail (#1039) is a popular hike, particularly in the summer and early fall, both because of the beautiful lakes that await at the end of trail as well as the loveliness of the scenic journey there. The trail initially introduces itself as a wide dirt lane of moderate grade with some roots and rocks for intermediate interest. Today, the trail was painted white with snow tipped trees and branches, offering even more picturesque scenes along the way and around the many switchbacks. Having been here two previous times, I remembered almost immediately how much I loved the numerous bridges and stairs throughout Talapus Lake Trail. There are so many, but none are really the same: modern stairs with clean lines winding around large curves, rustic planks built just above the ground, and makeshift logs crossing over runoffs. Being the first one on the trail this morning allowed me the privilege of seeing these architectural delights coated with untouched snow. The warmth of the ground didn’t allow for any snow to collect at first, leaving the path a dark shade of chocolate to offset the sparkling white for most of the route to Talapus Lake. Mother Nature decided to either discipline us for not trusting her to maintain the balance of life during the summer drought or to reward us for waiting so patiently all year to come through with much needed rain. Western Washington has been inundated with wintry weather for the past two weeks, including two major storms that have together produced more precipitation in our upper peaks than throughout all of 2015. 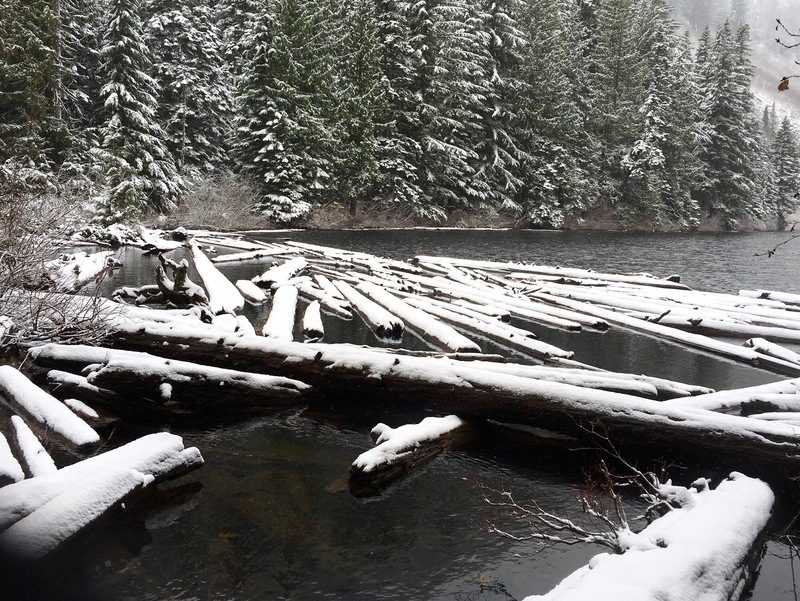 This weekend’s storm caused many trail and park closures throughout both the Cascade and the Olympic mountain ranges. The system even had Little Hiking Buddy unwilling to go outside for Adventure Friday (we opted to ice skate indoors instead, but I digress!). When I was last at Talapus Lake Trail with LHB back in September, the autumn day had been unusually warm. We enjoyed our snacks at a point on the trail where Talapus Creek calmly rolled over rocks down the ravine. Today was not the case, as the creek overflowed with angry torrents of white water throughout the entire trail. Rather than taking the obvious trail towards the eastern shore of the lake, I turned left and headed off on a less popular trail. The ground here was blanketed in a thin layer of snow and tangled with bare branches of what once was overgrown brush. I made my way up and around until I reached a dead end on the shore. From the swampy edge, I had a wintry vision of a black diamond lake against the endless backdrop of snow tipped evergreens. I continued up the main trail away from the lakeshore. 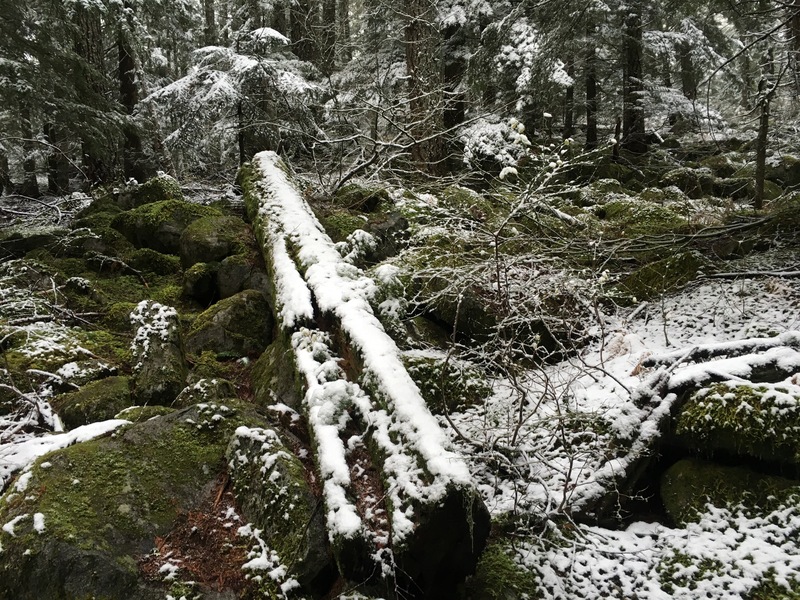 At first, the trail was just as muddy and brown as it was on the lower section, then it slowly morphed into snow-dusted tree roots highlighting the way until the rocky trail was hidden under a veil of white flakes. This gradual change was Mother Nature’s beautiful unwinding of fall into winter. Time seemed to slow down just as the white fluffy flakes seemed to suspend themselves in the air before allowing the forest’s final transformation to winter. 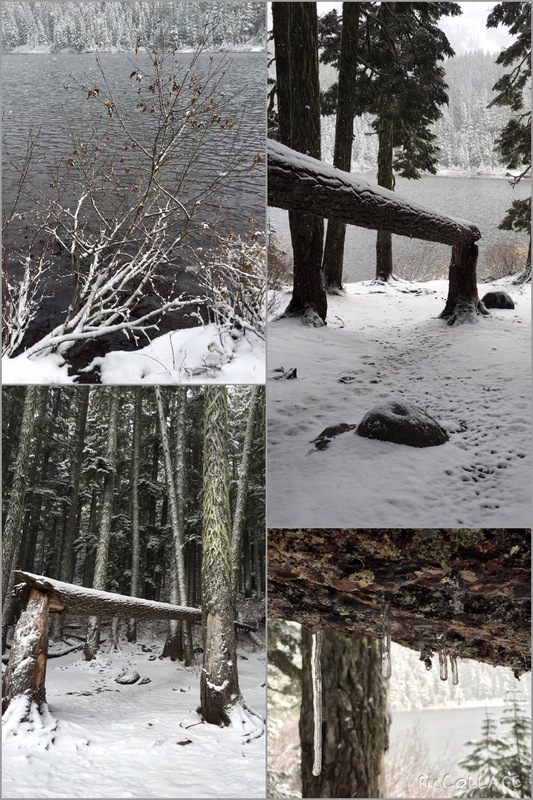 When I reached the junction to Olallie Lake, I was confronted with the choice between a rocky trail coated in wet snow or traversing Talapus Creek at a dangerously overflowing crossing. I put my ego in my back pocket, replaced it with common sense, and headed left towards the snow. Instead of bypassing it had I gone right, this trail led me directly to the shores of Olallie Lake. I made my way down the snowy slope past a felled tree hosting icicles dangling from its trunk. The shore here was dotted with frosted bare limbs reaching out from an edge of white. A snow shower arrived quickly, changing from a light flurry to a moderate flow of fluffy whiteness. I took the moment to enjoy the serenity of this lakeside snowfall with a well-earned snack break. My home-baked cookie and hot coffee was absolutely perfect. Most day hikers would consider this the perfect end destination and head back home. Having already hiked through Talapus Lake Trail twice before with LHB, I wanted to explore deeper into the mountains since I was on my own today. After trekking back up the basin slope, I continued onto a mildly steep boot trail up Pratt Mountain. Given the snow overlay of this underused trail, I pulled out my map and compass to make sure I was heading somewhere in the right direction. I was indeed, as I was making my way to the saddle of Pratt Mountain. At the top of the boot trail, I connected with Mount Defiance Trail (#1009). There I met a hiker who was on his way back to Pratt Lake Trailhead after a morning jaunt in the fresh snow. He directed me towards Island Lake, but suggested I keep away from the basin due to hazardous storm conditions. Following my reroute at the creek crossing, I no longer had a scenic destination in mind. It felt completely freeing to have no detailed plan at that moment, so off I went to explore the trail where ever it would take me. AND AM I HAPPY I DID! The trail towards Island Lake was blanketed in untouched snow, except for a set of rabbit prints. 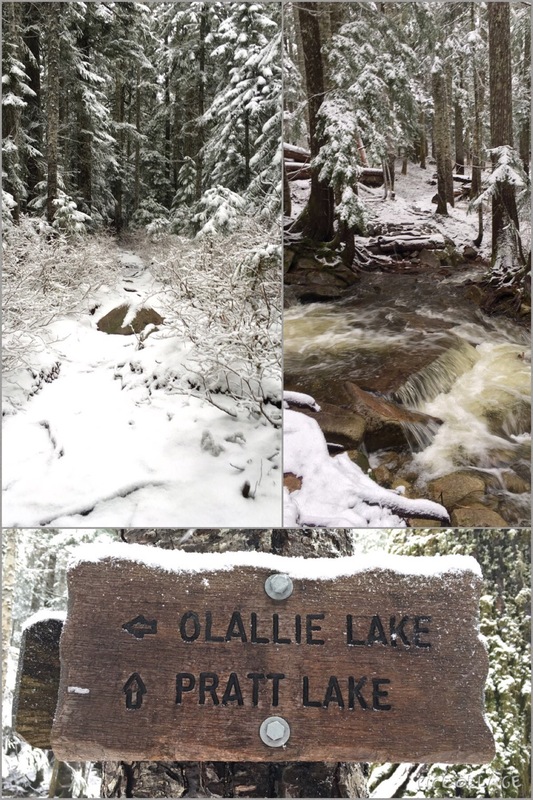 As I followed Thumper’s tracks throughout the ridge line, it occurred to me that I had not encountered any other sign of wildlife since reaching Olallie Lake. I was where I wanted to be – alone in the back country experiencing every sensation Mother Nature allowed me. I saw the movement of snow falling, I heard the sounds of the creek flowing, I smelled the snow on fresh pine, I touched the frosty cold of icicles, and I tasted the perfect cookie. Although my microspikes kept me on solid footing in the icy mud, the wet snow from today’s storm turned into balls of debris-filled ice under my feet with each step. Alas, I had the perfect chance to break out my snowshoes! Granted, the snow wasn’t really deep enough to go very far with them on, but at least I got to test them out. The MSR Lightning Ascent snowshoes lived up to expectation. The narrower width made it easy for me to get up and down the trail without tripping over myself (as I’ve done many a time with just my own two feet), while the Televators truly aided me up some rocky switchbacks. I had a lot of fun testing out this early Christmas gift from my husband, even if it was for just a short distance on the trail. I can barely wait to use them for some real snowshoeing this winter! I think I met my guardian angel today. Just as I was returning from the saddle on Pratt Mountain, I met an older gentleman who, upon reaching the midpoint of his journey, had stopped to admire the view of the lake below. This gentleman was truly that – a gentleman. He struck me as someone my husband would enjoy not only a beer with, but an extended two-person backpacking trip as well. (Mind you, I am pretty wary of strangers and have created anxiety among ALL my female friends for hiking alone in the backcountry; however, I like to think I have a relatively decent judge of character given the breadth of people who have come through my life.) We chatted briefly about the trail up towards Island Lake before parting ways. As I continued on, he disappeared from sight, only to re-emerge behind me seemingly from nowhere. He had gone to explore a section of Talapus Creek, but discovered it was too uninviting even for a lifetime hiker such as himself. Again, he went on ahead and immediately left my sight, until I found him stopped at the junction between Pratt Lake and Talapus Lake Trails. He mentioned being a longtime Seattle SAR volunteer, who wanted to make sure I didn’t miss the turn to Talapus Lake as many often have (particularly after two women recently got lost overnight not too far from where we were). Then he vanished! I caught up with him on the other side of the same overflowing creek that initially turned me towards Olallie Lake. Even he was having difficulty finding a safe place to traverse the water without being pulled downstream. After I embarrassingly slipped and fell twice, he helped me across the creek to higher ground. Honestly, if it weren’t for this amazing man, I probably would have had to either backtrack up 2 miles for a steep descent to Olallie Lake or hike down to Pratt Lake TH in hopes a kind soul would drive me back to Talapus Lake TH. I never caught his name, but I dedicate this post to him. Thank you guardian angel! Once we safely crossed, I profusely thanked him. He went ahead and disappeared within seconds. 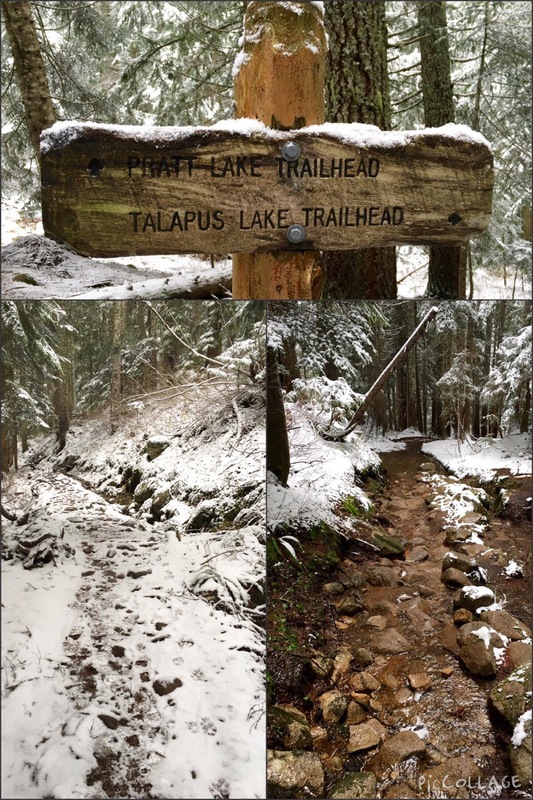 From there, I continued down Talapus Lake Trail back the way I came. The snow had turned from the morning’s fluffy white goodness to the afternoon’s crunchy balls of ice, revealing a more intricate winter spectacle. Within the last two miles of my descent, I crossed paths with several pairs of hikers heading to Talapus and Olallie Lakes. Their experience on the trail was far different from mine – warm, muddy and filled with conversation – but not any less fulfilling. It was a day of circles, loops and revisits, rounded out by a bluebird sky on my drive home. 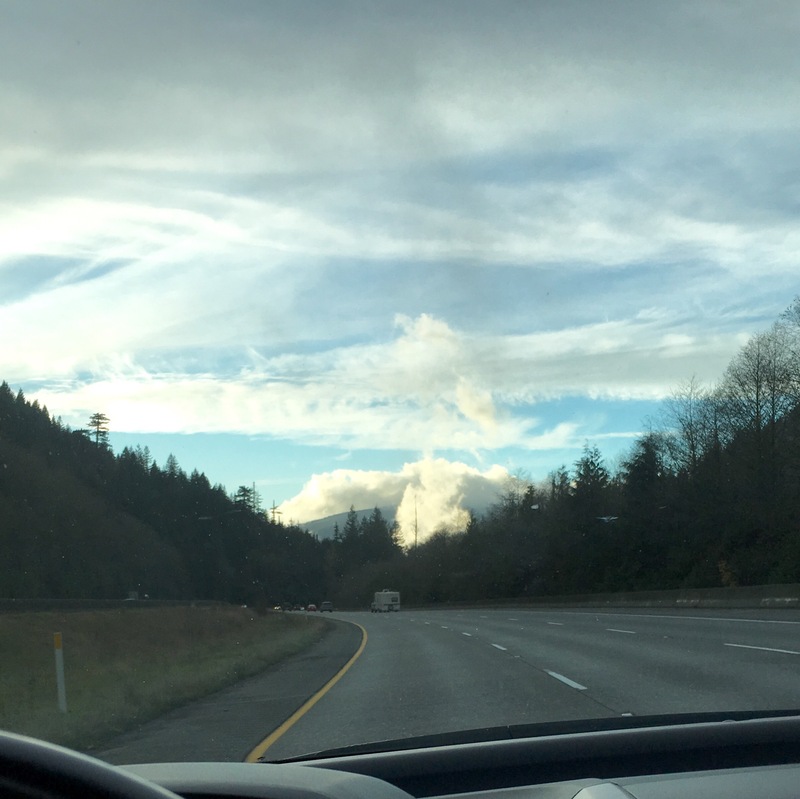 My drive home was a welcome sign of sunshine. 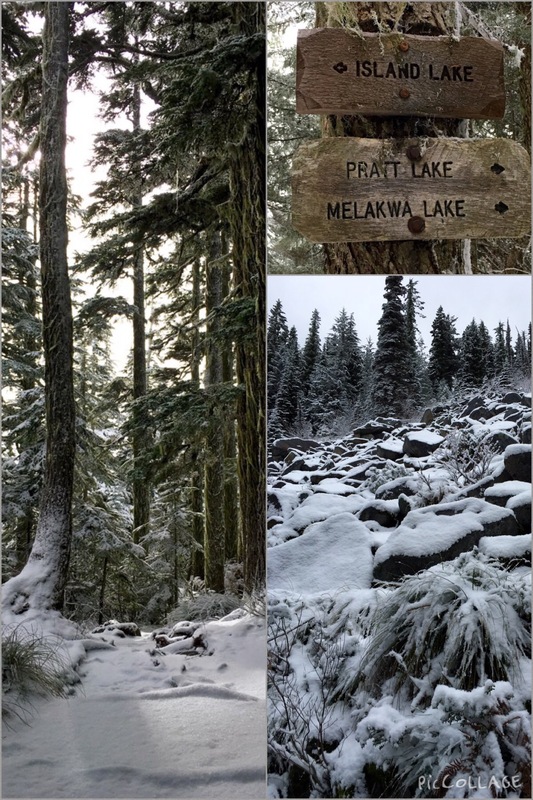 Wonderful post, I love that hike and it is SO good to see some snow up there! This year is going to be so much better then last year, I better start dusting off my snow shoes! I cannot wait to learn more names of trails so I can describe where I’ve been for my family. It sounds like you had a great time hiking, and beautiful photos as well. Your guardian angel appearing and vanishing made me smile from ear to ear – what a kind man. Hope you meet him again!